The tightly coiled leaves of Curled Parsley are surrounded here by Italian Flat Leaf Parsley. Curled Parsley is a tasty, breath purifying, nutritious garnish rich in vitamins and definitely worth growing your own to get the freshest possible leaves to eat, cook with and juice. 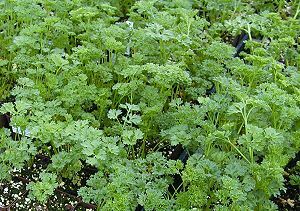 Plant new Parsley seedlings every spring. 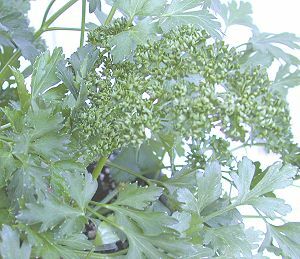 Even though the Parsley will come back again the second year, it will make few leaves and lots of flower heads. While the flower heads are great at attracting beneficial insects, the leaves are of poor quality for humans. For the best flavor and the most nutrition use fresh parsley instead of dried. In recipes calling for dried parsley use up to three times as much fresh Parsley. This plant is often available in plug trays. These trays hold 128 of all the same plant. They are a great low cost way to fill a lot of space. Each cell is 3/4 of inch by an inch. Check here to see if Curled Parsley Plug Trays are available.